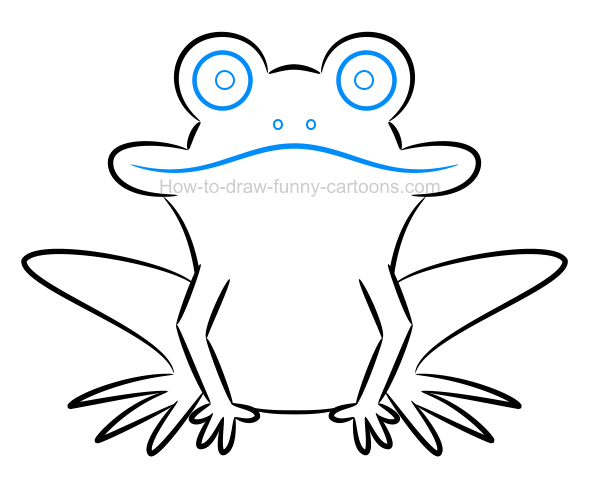 Learn how to create a beautiful illustration of a frog and then see what could be the best posture for this new and exciting cartoon animal! 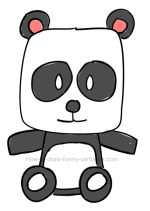 Indeed, our goal is not just to illustrate this character properly using simple lines, shapes and colors, but also finding how to select the proper posture to make this adorable animal visually appealing and easily recognizable. 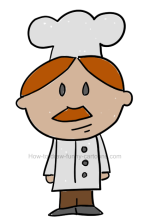 Make sure the mouth is large, thin and made from curved lines. The top of the head can be narrow, round and located between the eyes. These eyes are round and pupils are made from large dots. The nose is depicted using small dots filled with dark green colors. Both back legs are long, thin and drawn using delicate lines. The fingers on the back legs are long and thin. Don't forget to sketch a large patch on the stomach of the cartoon frog. The front arms are small and fingers are made from tiny curved lines. The neck is slightly larger than the body. 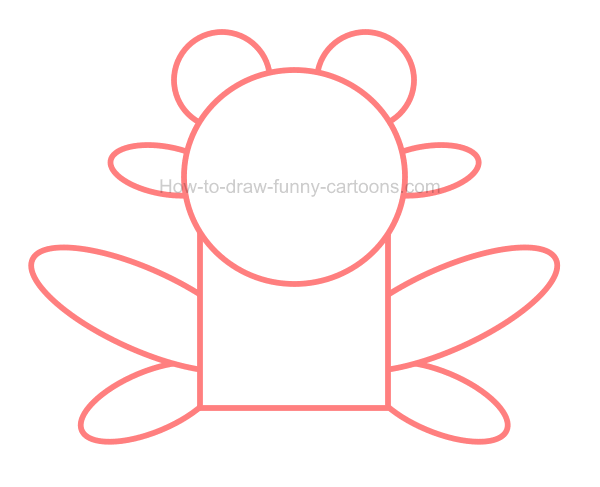 Let's begin this lesson by adding a few basic shapes to help us illustrate the animal. 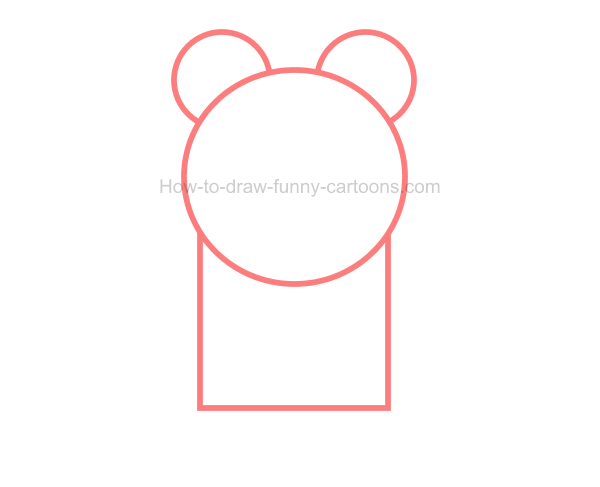 First, draw a large circle to represent the head of the character. Then, you can draw two small circles on top of the first one to form the eyes. 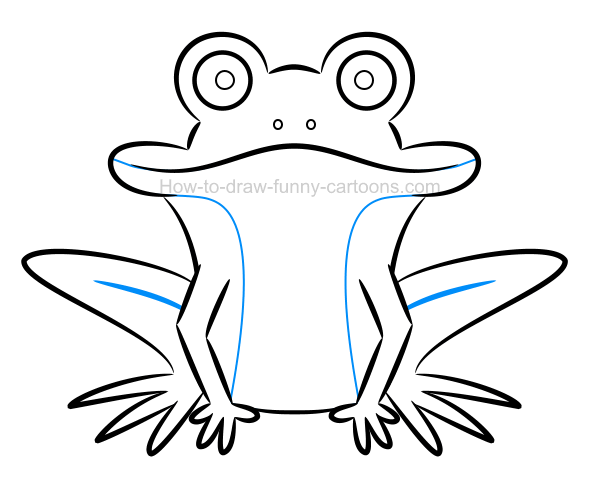 A solid square can be added below the head to depict the body of the cartoon frog. 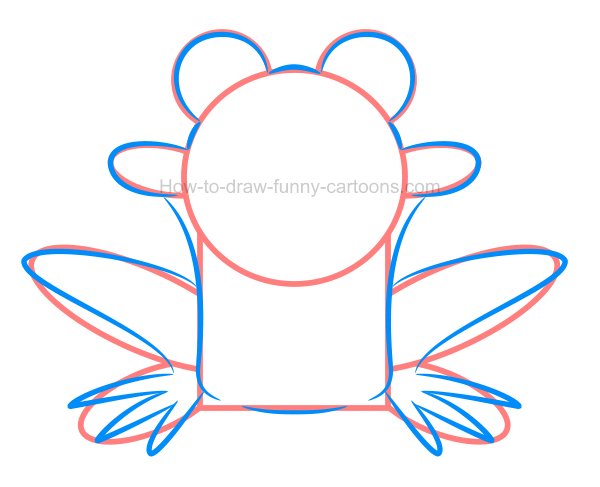 On both sides of the head, sketch small oval shapes that will be used to illustrate the mouth of the frog. Finally, create the back legs using more large oval shapes as shown in the illustration below. 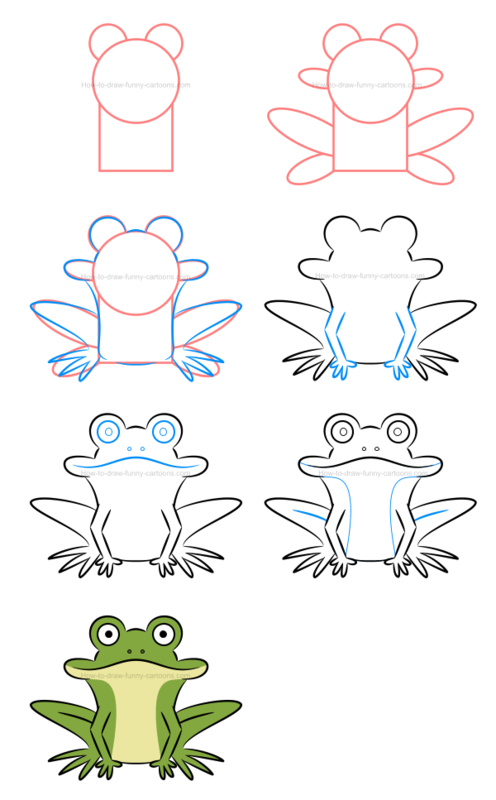 We now have what it takes to help us create the perfect illustration of a frog in just a few easy steps. 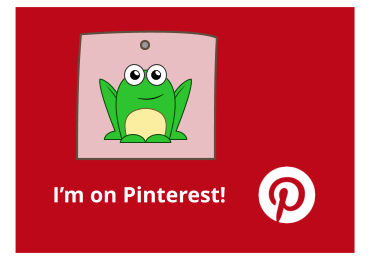 Use all shapes created previously to guide you with the creation of the frog. 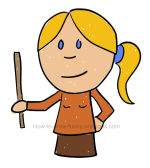 Most parts of the character are done using long curved lines that are made with pointed ends. 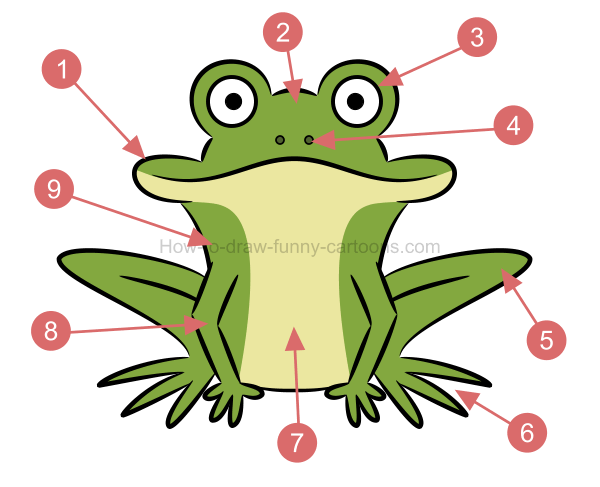 Pay attention to areas like the eyes, the mouth, the back legs and the fingers. When you are done, you can erase all shapes created for the template. In front of the character (and near the bottom of the body), you can sketch both arms using a few straight lines. Fingers added below these arms are made from small curved lines. 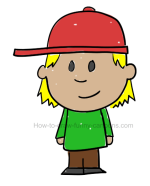 Make sure that both arms are slightly bent to show both elbows. In both areas drawn above the head, sketch large circular shapes to form the eyes. The pupils are made from smaller circles. Then, create the nose using tiny circles. The mouth is made using a long curved line. Excellent! 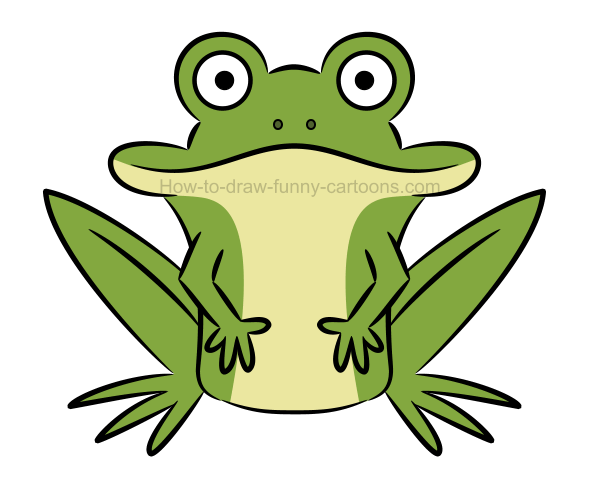 This illustration of a frog is almost completed now! 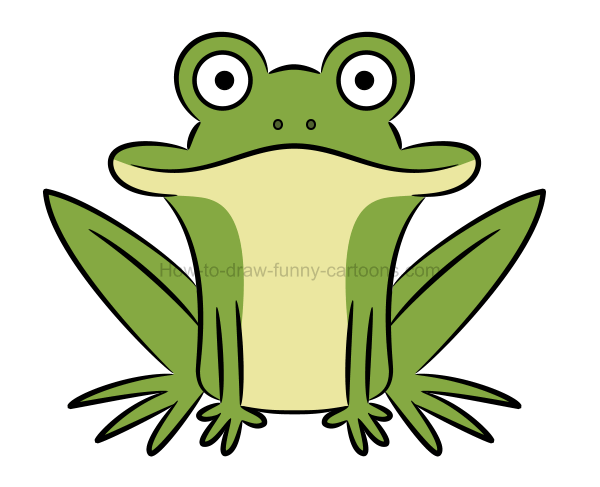 The whole cartoon frog can be filled with a bright green color. The patch found on the stomach can be colored in a light yellow color that can also be close to green. The eyes are white while the pupils are black. 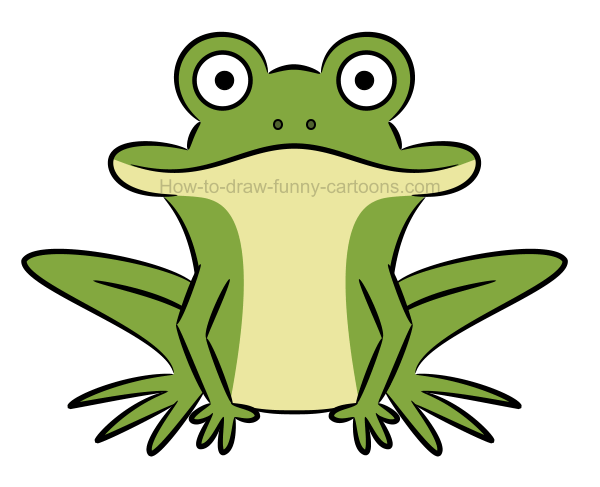 That's it for this lesson on how to draw an illustration of a frog using simple shapes and colors. 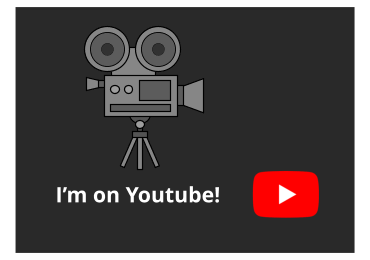 Let's proceed to the next section of this tutorial. 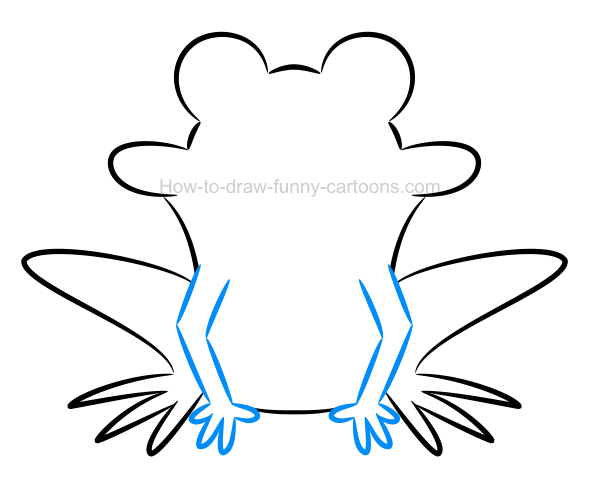 In the original version of our illustration of a frog, the hands of the cartoon character were touching the ground. In this example, the arms and the hands are now in the air. The animal seems to be touching is belly. That's an interesting option although it might not be the most appealing one. In this second attempt, the arms and the hands of the animal are hidden behind the body. 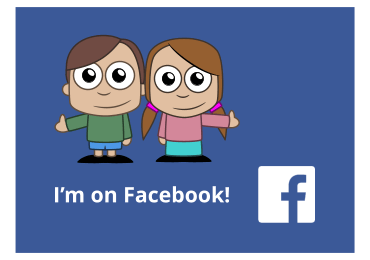 It's not a realistic alternative, but in the wonderful world of cartoon this option can be an interesting one. 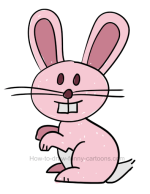 Nothing needs to be 100% realistic when drawing cartoon animals and this example shows that something anatomically incorrect can still work. Let's go back to the first attempt we did in this second part of the tutorial (the one with both arms raised), but this time let's also raise the legs. Do you like this option? Does it feel genuine? Personally, it's not my favorite although I must say that it's still as effective as the original version. 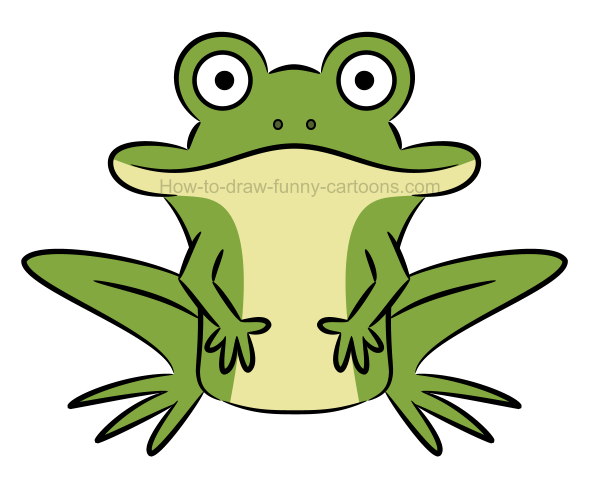 This last example of an illustration of a frog with a different posture is one of my favorites. Both arms are straight and hands are touching the ground. The legs are up, just like in the previous step. 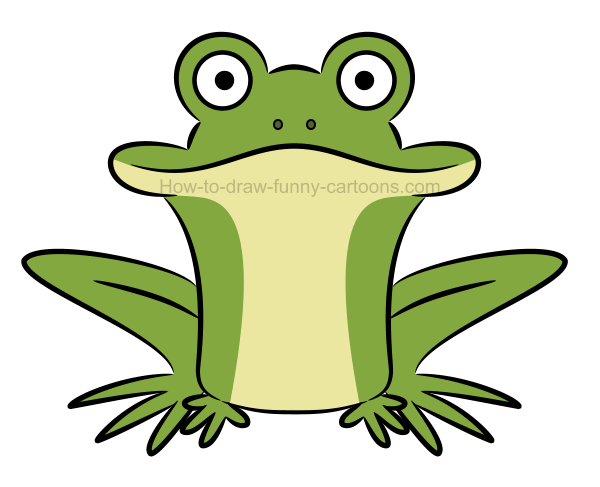 This frog seems confident and visually more interesting. As you can see, sometimes a small modification of your character's posture can make a whole difference (for better or for worse). Pay attention to every details and try to figure out exactly the feeling and the attitude you want to portray throughout your work. It's easy to miss the point by sketching a character that doesn't depict what you had in mind in the first place.